Spaces Fill Quickly - Contact Us Today! 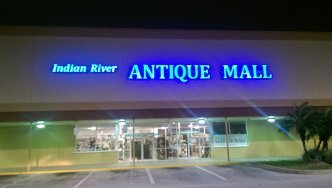 Indian River Antique Mall is a 20,000 square foot climate controlled shopping mall that offers one of the largest and most diversified selection of Antiques, Vintage, Furniture, Jewellery, and Shabby Chic merchandise in Melbourne and Brevard County. The inventory is constantly changing. Stop by and browse often! Looking for something to do in Brevard County? Rain or shine, always shop in comfort with wide isles and 72 degree temperatures. We are located at 1433 South Babcock St. Melbourne, FL., on the corner of Hibiscus and South Babcock St.
We are an Antique Dealers Dream Partner! We offer a business model that works. We practically do everything, all you need to do is bring in your merchandise, set up and start selling. We take care of everything, including: sales, advertising, utility, sales taxes and many other logistics. NO CREDIT CARD FEES!! Indian River Antique Mall is managed by Industry Experts that understand marketing to the right customers. High traffic Mall location without significant overhead costs. Booth costs never go up, as long as you remain in your original booth. Mall is open 7 days a week M-S 10:00 am 5:30 pm Sun 12:00 5:30 pm. At one point as Antique and Vintage Dealers ourselves we built a successful full time business of buying and selling Antique and Vintage merchandise. Located in a beautiful Melbourne Shopping Center in Brevard County, near Historic downtown Melbourne, world famous Melbourne beaches, Cocoa Beach, Cape Canaveral, and minutes from Orlando. Visit us at 1433 South Babcock St. Melbourne, Florida 32901 on the corner of Hibiscus and South Babcock St. in Melbourne Shopping Center next to Melbourne High school. We offer a constantly changing inventory of the most unique items in Central Florida. The most amazing items come through our doors, but they also leave quickly. Don't Wait! See what you can find at Indian River Antique Mall, Today!